"Go West" was written and originally performed by the group ‘Village People’. It was an instant hit in the disco scene during the late 1970s. Victor Willis, Henri Belolo and Jacques Morali are credited as the song's writers, although Willis disputes Belolo's involvement. In 1992, when Pet Shop Boys were asked to perform at an AIDS charity event at The Haçienda nightclub in Manchester. Keyboard player Chris Lowe selected "Go West" as the song they would perform. Though singer Neil Tennant forgot the lyrics during that performance, the duo decided to record it as a single. The song was released the following year and it became their biggest 90’s hit. 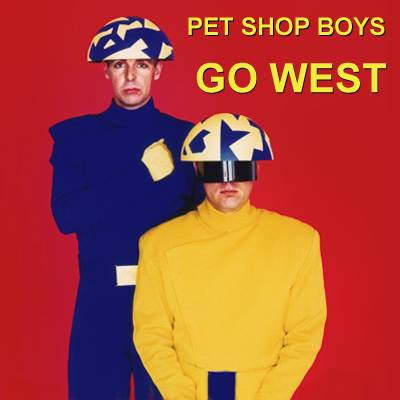 The lyrics and video of the Pet Shop Boys are heavily laced with references to the songs origins and the conflict between East & West, Communism & Capitalism.